Located on the southern tip of the Sinai Peninsula, a dream resort set on the idyllic coast of the Red Sea, one of the most immaculate spots on earth. With an unrivaled location on the shores of one of the most beautiful seas in the world, in one of the most unspoiled spots in earth, the Crowne Plaza Resort in Sharm El Sheikh was expertly designed to deliver it's guest pure excellence. The resort's beachfront features the famed coral reef named "The Far Garden" considered one of the most beautiful spots for snorkeling and scuba diving in Sharm El Sheikh. 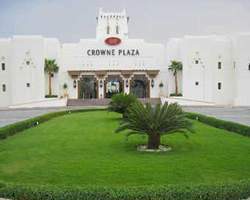 The Crowne Plaza Resort Sharm El Sheikh offers 400 carefully appointed guest rooms including 45 luxurious suites and 36 Crowne Club Rooms and Suites in selected locations, providing the ultimate in comfort and in room amenities. Crowne Plaza Resort guest accommodations are spread throughout the resort, with 70% offering spectacular sea views, as well as the option of non smoking rooms and accommodations equipped for guests with special needs. The Crowne Plaza Resort Sharm El Sheikh is proud to offer its guest the most exquisite assortment of tastesm, an early morning snack,, a light lunch or a full course dinner at the beach, we promise to deliver nothing short of extraordinary. Set in a typical Moorish atmosphere, offering a sumptuous buffet variety for every occasion, from breakfast through lunch and dinner. Sample our wide choice with something to suit every taste and let us surprise you with our daily themed dinner buffets. Take pleasure in an “al fresco” dinner on the terrace, while assisting to one of our international shows, prepared for your enjoyment by our animation team. C-View BBQ proposes the finest "catches of the day" in an amazing beach and pool side venue featuring live cooking and your choice of fresh fish and meat straight off the charcoal grill. Overlooking the “Far Garden” coral reef and El Pasha bay, C-View is the perfect venue to enjoy a quick open air lunch or indulge in a romantic sunset dinner. For true connoisseurs of the Italian cuisine, there is no better place to flavor the mouthwatering delight of its specialties than at Via Veneto. Inspired by one of Italy's capital most famous streets and located right in front of Crowne Plaza Resort Sharm El Sheikh suggestive Roman pool, your meals are guaranteed to be transformed into a romantic fresco, set in the scenery of the ancient Rome. Via Veneto serves “a la carte” lunch and dinner as well as a selection of light snacks and beverages throughout the day. Crowne Plaza welcomes the arrival of the Viennese Café situated in the Lobby, offering a wide variety of Panini’s, Patisseries, Hot drinks, Smoothies and Healthy options. Enjoy the authentic Lebanese atmosphere and taste the oriental drink specialty together with a shisha, the famous water pipe. For dinner enjoy the true Lebanese mezze & grills with freshly baked bread. The Crowne Plaza Resort Sharm El Sheikh offers a selection of meeting rooms overlooking El Pasha Bay, ideal for your banquets, conferences or any other event of your choice. Select the venue that best suits your needs from two multi-purpose functions rooms on the lobby level and three breakout rooms on the mezzanine, perfect for your private business meetings. The Casablanca and Agadir Rooms, 180 m² in size, can accommodate up to a maximum of 200 guests each. Choose the set up of your choice; whether reception, theater, banquet or classroom style and profit from the option of dividing the Agadir room into two spacious halls at your convenience. The function rooms' adjoining terraces can cater for cocktail receptions or that special occasion, with a splendid view over the azure waters of the South Sinai Sea. Business Center The hotel provides a comprehensive range of business facilities to accommodate your needs, including the use of desktop computers, internet access, fax and photocopying services. The Crowne Plaza Resort Sharm El Sheikh offers you a wide array of activities, from the early morning till the late night hours, guaranteed to make you always find something to suit your taste. The "Leisure Crowne", Crowne Plaza Resort Sharm El Sheikh comprehensive Health club and Spa, features a state of the art gymnasium, aerobic studio, year round heated outdoor swimming pool, tennis and squash courts, spa facilities, as well as a carefully assorted range of massages. Choose from one of our five swimming pools, located strategically across the resort; relax at the impressive Roman Pool, join Crowne Plaza Resort Sharm El Sheikh animation team in one of their activities at the Beach Pool, take Scuba lessons in the specially designed Diving Pool or simply enjoy the panoramic view from our kidney shaped swimming pool. The resort's beachfront features the famed coral reef "The Far Garden", considered one of the most beautiful locations in Sharm El Sheikh for snorkeling and scuba diving.